Dabang Delhi fell inches short of registering a monumental comeback against Haryana Steelers in Tuesday's Pro Kabaddi League encounter. Despite trailing by a massive ten points owing to Wazir Singh's monstrous five-point raid, the side from the capital did not crumble and kept it tight at the back. It was refreshing to see the away side produce a mature performance. However, the Steelers had enough quality in their arsenal to see off the win. 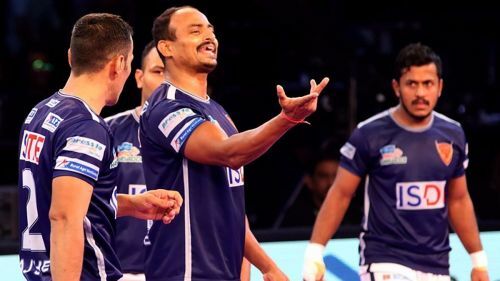 It must be noted that Dabang Delhi were playing without two of their most important players -- captain Meraj Sheykh and defender Nilesh Shinde. The coach, Ramesh Bhendigiri, provided an update on their injury status. "When Meraj played against Bengal Warriors last time, he suffered an ankle injury. Our home leg is coming up as well. that is why we decided to give him some rest. We have even given Nilesh Shinde some rest." "They only have small injuries, nothing big. Once they rest for two or three matches, I am sure they will recover. They need a minimum recovery of one week, that's why they have been rested," the coach stated. Bhendigiri went on to explain why it is crucial for his important players remain completely fit for the dreaded home leg. He reckons, the other teams haven't planned their recovery periods well and as a result have had to play without some of their most important players. Delhi's coach is extremely cautious about repeating the same mistakes. "We have to play six matches at home, what will happen if someone gets badly injured? Many players in other teams have lost their main players for the entire week. One can't recover from a big injury and then the team combination gets disturbed," he said. Post Ranchi, the Pro Kabaddi League will move to Delhi, providing a great opportunity for the capital side to build on their recently improved performances. The coach admitted the players suffer a lot of strain playing six matches at home. However, he was extremely pleased with his side's performance despite the absence of Meraj and Nilesh Shinde. "The team has performed really well without them. We were trailing by a huge margin and we came back well. I am happy," he signed off. Dabang Delhi will next play Jaipur Pink Panthers in Ranchi on September 17th. Bhendigiri expects his star players to be match fit in a weeks time, raring to go.